— about the expansion of government, about immigration, about secularism, about the mainstreaming of what used to be the avant-garde. How convenient. Nothing about the current occupant of the White House, nor…. This family represents the cultural changes that have enveloped parts — but not all — of America. To cultural conservatives, this doesn’t look like their country at all. …slavery was not a benign institution in which mostly benevolent whites owned innocent and grateful blacks. Well, yeah. Better late than never, to be sure. But 2013, and seventy-two tours around the sun is damn late indeed to be figuring that one out. To be clear: I do not think Cohen holds any racial animus against New York’s mayor-elect and his family; I doubt he’s troubled by interracial relationships; I don’t actually care whether or not “in his heart” Richard Cohen has trouble with people of color. To put it another way: we know Cohen is clueless* — there’s no other explanation for his self-described late aspirations to wisdom on the matter of owning other human beings. But mere obliviousness still can’t excuse malice — and that’s what flows with granting any respect at all the view that the sight of a white man and a black women sharing their lives in marriage should make one gag. To put it yet one more way: this is Cohen’s argument stripped naked: Thesis one: the GOP is not racist. Thesis two: a key element of the Republican Party is racist. Conclusion three: well, maybe the GOP has a racism problem it’s OK (sort of) because those nice conventional folks are simply mourning the fact that most Americans no longer tolerate such crap. How does that add up? What kind of mind writes that paragraph and doesn’t go “Wut?” … and try again. Last question: Cohen is a terrible columnist, a weak thinker, a man suffocating in swaddling of past-its-sell-by-date received wisdom and second-hand knowledge. But the Post chooses to employ him and you’d think they’d have the compassion, (not to mention the self interest) to protect him from himself. Shorter: Don’t they have any editors down there any more? Who the f**k let that “conventional” slip by? As with the Dixiecrats, the fight is not over a particular program — although Obamacare comes close — but about a tectonic shift of attitudes.I thank Dennis J. Goldford, professor of politics and international relations at Drake University in Des Moines, for leading me to a live performance on YouTube of Merle Haggard singing “Are the Good Times Really Over.” This chestnut, a lament for a lost America, has been viewed well more than 2 million times. It could be the tea party’s anthem. Uh, Richard. In these dayz of the intertubes, two million views over five years is…not impressive. Hell, I’ve been listening to some Edward Sharpe and The Magnetic Zeros lately (now there’s a band on the zeitgeist, right? ), and the official video of their folk-groove song “Man on Fire” has scored over three million hits in the last eighteen months. You want to talk about music at the point of cultural confrontation that Cohen’s talking about? Well then, how about Macklemore & Ryan Lewis’s hit “Same Love feat. Mary Lambert” (which features and interracial gay couple, btw)? Almost 95 million views on Ryan Lewis’ channel alone, and many more millions elsewhere. It’s not that Cohen’s wrong on the basic point. Running through the GOP’s current turmoil there is a profound rejection of the whole broad politics and culture that flows from (inter alia) the real advances in civil rights we’ve seen in this country. But this business of making cultural commentary about a Youtube video isn’t about that argument. Instead, this is a question of whether or not Cohen is up to his job. Here, he doesn’t seem to have the basic contextual understanding he needs to draw any inference from a data point like 2 million Youtube views. It’s not just the “conventional” racists who don’t recognize this country. Cohen’s making heavy weather of it too. 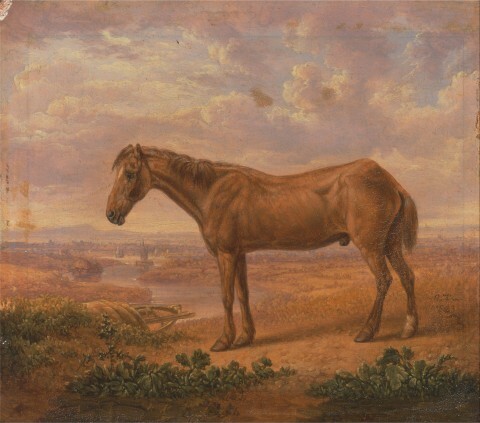 Image: Charles Towne, Old Billy, a Draught Horse, aged 62, 1823.